MOSCOW, October 7. /TASS/. 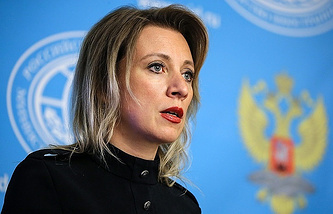 Russian Foreign Ministry’s official spokeswoman Maria Zakharova has said that Russians may soon vote for ceasing diplomatic contacts with US State Secretary John Kerry. "By making statements equating Russia’s actions in Syria with war crimes, the US State Department should understand that this may all end with the national referendum in Russia with one question: ‘Shouldn’t we just turn off telephones in the Foreign Ministry?’," Zakharova wrote on her Facebook page on Friday. Kerry earlier said that the actions of Russia and Syrian government forces should be investigated as war crimes.